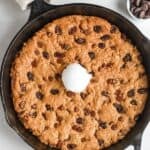 An easy recipe for a healthy oatmeal cookie skillet that is studded with chocolate and raisins, and is made with simple ingredients. Desserts that can be eaten out of a skillet, are easy to make, and are healthy make the perfect sweet treat! 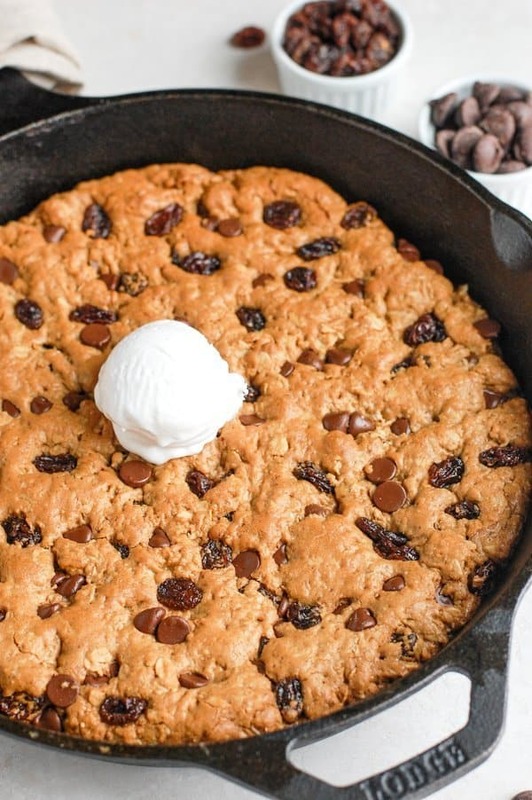 The only thing that is getting me through this day is the fact that I have this healthy oatmeal cookie skillet waiting for me when I get done work… you better believe I’m going to heat this baby up and put a scoop of my favorite non-dairy ice cream on top! I feel like most non dairy ice creams are really icy and just lack flavor but with each day, the different brands are making them better and better. I remember when I used to eat the ones that literally were like sugar and water mixed together and it was so nasty. 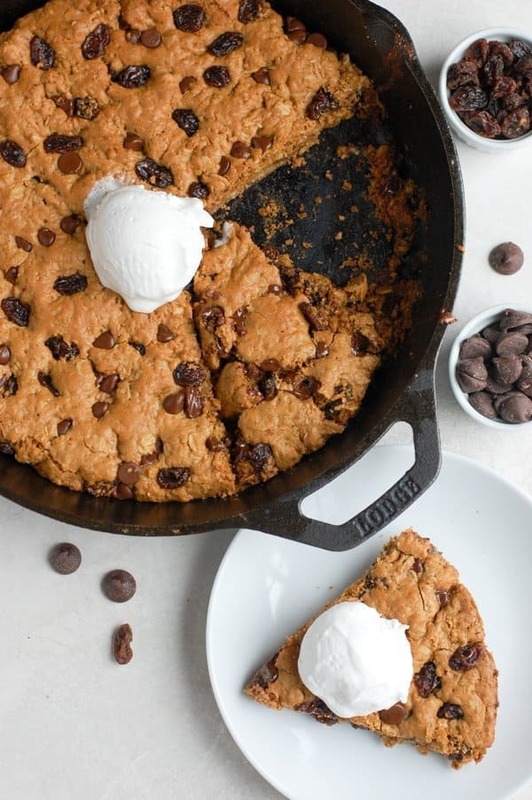 Anyway back to the cookie skillet. It’s no secret that I absolutely love making things in my skillet. I’ve been using it for everything lately, between baking healthy peanut butter cookie skillets to cooking crispy chicken thighs, its an absolute staple pan in my kitchen. I seriously think that everyone needs to have a cast iron skillet. So I’ll jump at any chance I get to make a cookie skillet and ever since a few weeks ago, I’ve had a serious hankering for oatmeal raisin cookies after being at an event and seeing the fresh plate of oatmeal raisin cookies just staring at me. Now don’t get me wrong, if you’ve been following me for a little while than you know I’m serious about my chocolate and no raisins are ever going to get in between my love affair for it, but I do love a good oatmeal raisin cookie, too. It’s even better when there are both chocolate AND raisins in one. Now that is my dream cookie. 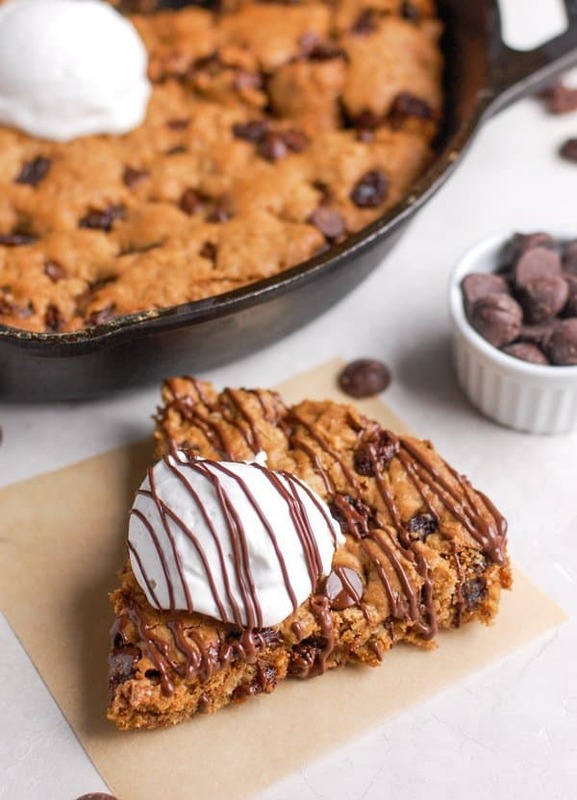 So it sparked an idea in my head to create some sort of chocolate chip oatmeal cookie skillet and that’s just what I did. 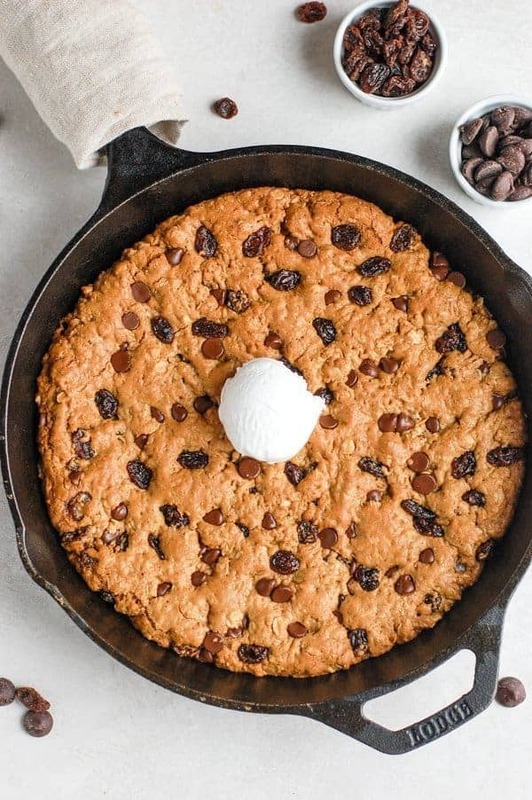 This healthy oatmeal cookie skillet is loaded with the perfect oatmeal cookie flavors like cinnamon and the nuttiness from oats, along with plump red raisins. I spruced it up a little bit by adding some dark chocolate chips to add some extra richness. It is best eaten straight out of the oven, because like most things with chocolate, those chips are even better when they are melty. Bonus points if you serve it with some vanilla ice cream on top. Feel free to add in anything else that you would like. I think this would be good if you made some sort of cranberry and white chocolate rendition. If you make it, be sure to tag me on Instagram! This cookie is so good! Thanks Erin!